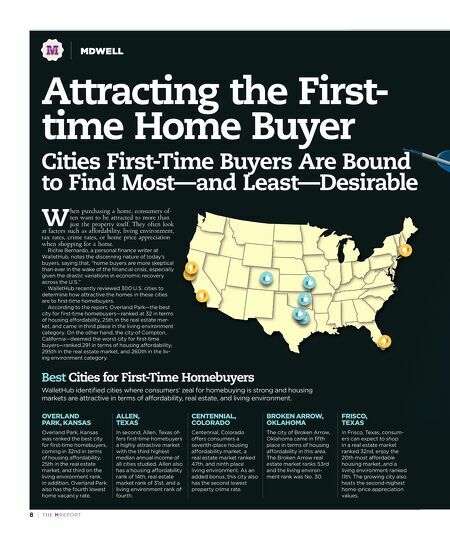 TH E M R EP O RT | 9 Source: WalletHub Worst Cities for First-Time Homebuyers WalletHub also identified cities that do not offer first-time buyers as many attractive features in terms of affordability, real estate, or living environment. COMPTON, CALIFORNIA Compton, California rests at the bottom of the list in 300th place. 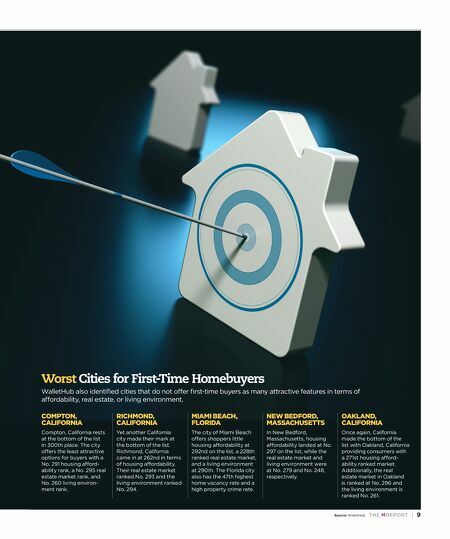 The city offers the least attractive options for buyers with a No. 291 housing afford- ability rank, a No. 295 real estate market rank, and No. 260 living environ- ment rank. RICHMOND, CALIFORNIA Yet another California city made their mark at the bottom of the list. Richmond, California came in at 262nd in terms of housing affordability. Their real estate market ranked No. 293 and the living environment ranked No. 294. MIAMI BEACH, FLORIDA The city of Miami Beach offers shoppers little housing affordability at 292nd on the list, a 228th ranked real estate market, and a living environment at 290th. The Florida city also has the 47th highest home vacancy rate and a high property crime rate. NEW BEDFORD, MASSACHUSETTS In New Bedford, Massachusetts, housing affordability landed at No. 297 on the list, while the real estate market and living environment were at No. 279 and No. 248, respectively. OAKLAND, CALIFORNIA Once again, California made the bottom of the list with Oakland, California providing consumers with a 271st housing afford- ability ranked market. Additionally, the real estate market in Oakland is ranked at No. 296 and the living environment is ranked No. 261.